Wherever Shedman runs a project he likes to go on a Shed Quest to find the best sheds in the zone. 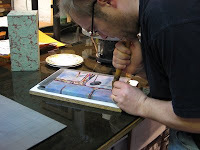 Mark Cockram is a bookbinder/book artist who's on a shed quest of his own. He's been invited to exhibit in the South Bank Centre in 2009. The exhibition is called the Pestival and is about the world as perceived through the eyes of insects. He wants to create a Garden Shed Gallery. Mark needs to find an old dilapidated shed that has lots of evidence of insects living in it. Can anyone out there help at all? If you can, send a message via Kontactr with a picture if possible - and while you're at it, tell Shedman what you do in your shed! Mark's teaching in India and takes his tea breaks in a shed.